I went through the archives and found another throwback post from my days as the Houston BBQ Examiner. 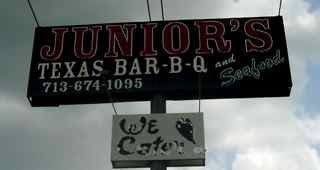 This time around, I'm sharing a restaurant review I wrote for Junior's Texas BBQ and Seafood! Although the restaurant and clientele may seem a little ruff on the outside, it is quickly apparent that Junior’s Texas Barbecue and Seafood is a place where everybody knows your name. It is apparent that the people sitting around the bar have all shared some good times together. The restaurant is homely and everybody is a friend. You will quickly find yourself caught up in a conversation with a stranger, enjoying a beer. The menu covers the classic barbecue and seafood dishes with little flair, but the food itself makes up for it. A perfectly sweet barbecue sauce accompanies the tender brisket and ribs, chicken and turkey, ham and sausage. The chopped beef sandwich is great and far from a sloppy-joe, like some of the other places out there. The beef in these sandwiches has a ruff chop that helps the sandwich to really stick together. The seafood options include fried shrimp baskets and poboys, all served with fries. The classic barbecue sides, beans, coleslaw, and potato salad are all there too. The only draw back is the service, which is where everybody being friends turns out to be a bad thing. Often times, the waitresses seem busier catching up with friends than bringing out the food orders. But, it is hard to feel unwelcome with the friendly waitresses, and the clientele make up for the wait, making the time fly by. All in all, Junior’s is worth a try. Stop by for lunch or dinner, or for a drink with friends after work.